In the coming months, the firm will decide whether to focus on growth through marketing and salespeople or technology, or both, CEO Tomczyk says. 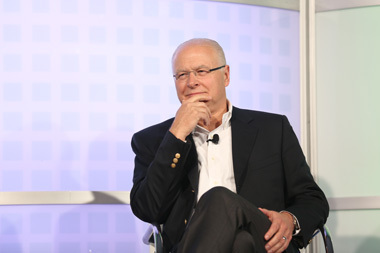 CEO Fred Tomczyk of TD Ameritrade. TD Ameritrade (AMTD) on Tuesday reported net income for the quarter ended March 31 of $189 million, down from $194 million a year ago, and earnings per share of $0.35, unchanged from the same quarter last year. Analysts were expecting EPS of $0.35 to $0.36. Revenues were $803 million, down from $812 million a year ago and below analysts’ estimates ranging between $819 billion and $830 billion. A 3.1% decline in average client trades to 477,000 a day accounted for the drop in revenues. The stock was down 1.65% in mid-morning trading to $35.83 a share. TD Ameritrade CFO Bill Gerber, in the earnings call, spoke about the challenges to trading due to missed expectations about Fed policy on interest rates. Original forecasts called for a Fed rate hike in June 2015, and now that’s been delayed until Sept. 15, according to Gerber. Looking ahead, TD Ameritrade CEO Fred Tomczyk said the company expects EPS will come in at the lower half of the firm’s guidance for the year, which ranges between $1.45 and $1.70 a share. On the plus side, TD Ameritrade reported that net new client assets were $16.3 billion, up 34% year over year, and growing at an annualized grate of 10%. Client assets totaled $695 billion, up 13% from a year ago and fee-based investment balances overall rose 16% to $155 billion. “We continue to get a lift from strong growth in all of major product lines: mutual funds, Amerivest and AdvisorDirect,” said Tomcyzk. Average balances on Amerivest, an online retail advice platform, were up 23%, while AdvisorDirect average balances rose 24%. Tomczyk said TD Ameritrade has initiatives to build its branch business and to leverage technology with robo-advisor offerings, but “take-up” of its nine robo-offerings has been “very light.” He said the firm will decide in the next three to four months about whether it will grow its business through marketing and salespeople or technology, or both.